When you work 19 years with HSE (Health, Safety & Environment) engrained in the everyday workplace culture, experiencing anything different comes as a complete and total shock. Understanding this mindset, here are my 10 Sure Signs Your Company Doesn’t Take HSE Seriously! If the person answers back “yes” there is a pretty good chance the company takes HSE seriously. If the answer is no I have the first obvious red flag. 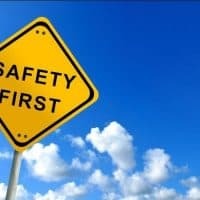 Companies that have strong safety programs teach their employees from top to bottom that you’re not only responsible for your own safety but the safety of others. If you see someone doing something unsafe you need to become involved. 2. Lock Out – Tag Out – Try Out, Isn’t a Team Effort – While OSHA 1910 doesn’t require this to be a team effort, companies who take their HSE program seriously require their operators and maintainers to work together in putting the lock-out, tag-out, try-out in place. This practice is not only good for communication, it helps to ensure your people understand what needs to be in place to ensure all energy sources have been accounted for and the equipment is indeed safe to work on. In companies who have above average HSE programs, the lead operator is always the first lock on and the last lock off. Companies with great programs ask this question on a regular basis. They understand we all make mistakes and there will be times when we miss a valve or some other source of energy that could have resulted in an incident. We need to learn from these mistakes and make sure no one else makes it again. Companies who think anyone is capable of safely locking out equipment on their own are an incident or spill waiting to happen. I would implore you start asking the question “Have we had any cases where LOTO was incomplete in the last week?” Encourage and reinforce people for speaking up! Plants that have good HSE programs have equipment and components that are clearly labeled. Those that have great programs have the tags on equipment and components that match the tag numbers on their drawings. It’s quite evident when companies don’t take HSE seriously, walk the floor and look at the equipment and components. Every pipe, valve, starter, disconnect, motor, pump, tank, instrument, and e-stop should be labeled. While the automation can be a wonderful thing, one of the down sides of automation is we tend to get lazy when it comes to knowing our equipment and understanding how the components and program work together to make the process occur. Companies who have solid HSE programs hire and train people that have a hands-on understanding of how their process works, where their assets are located and the function each component performs. If your operators and maintainers can’t answer these questions, you had better get serious about training your people. I would like to retire the excuse “We’re Different” by stating this fact; The only thing that makes your site different from every other plant I have visited including others in your exact industry is at some point you all collectively quit caring. There is no excuse to allow you equipment to leak in such a way that the entire plant is a mess from top to bottom. I don’t care if the product your leaking is baby powder, water or non-explosive dust, the fact that you allow it to leak all over every other component and instrument in your plant has a direct impact on the safety of your people at this site, and reliability of that equipment. Companies that have good safety programs make sure their Supervisors, Managers and Engineers make themselves present on the shop floor on a regular basis. (Supervisors at least 6 times a shift) Companies that have great programs, audit some component of their program in teams at least once a week. Companies who don’t care leave their employee safety program up to the Operators and Maintenance technicians and hope it works! If you’re interested in the rest of the story, the employee involved in the incident had less than 6 months experience and wasn’t aware there was a start-up procedure. He had been shown how to start the equipment by 3 different Senior Operators each using a slightly different method. When we had one of the operators produce the start-up procedure from the control room, the procedure was found to be 18 years old and several valves and steps in starting the equipment had become automated. Going back to the Manager with this information, he quickly pointed out that it was the Supervisors responsibility to keep the procedures up to date and to review them with the Operators. So, tell me again, how did we ensure that this incident won’t happen again? Companies with strong HSE programs perform a formal RCA (Root Cause Analysis) and identify all causes to a level that ensures the incident won’t happen again. Companies who have poor HSE programs point fingers and assign blame. 8. Experienced Maintenance & Operations Personnel Aren’t Included in New Equipment Design – On its own, this doesn’t necessarily make your company unsafe but it does create the opportunity for incidents, including injuries, spills, emissions, and long term ergonomic issues. I can say without a doubt, the companies I have worked with that have top notch HSE programs all include their Operations and Maintenance people in their design reviews. At a company I worked with recently included two of their key Operators and Maintenance Technicians for the first time. In working through a RCM Analysis on the new design they located over 200 necessary modifications. Of the changes identified, 187 could have had a direct impact on Health, Safety or Environment. Changes identified included component types, locations, trip hazards, bump hazards, installation of 3 monorails for lifting, and changes to material types. Failing to consider the context in how we plan to operate our new equipment and the environment we plan to operate it in will result in direct adverse effects in the reliability of your equipment. Companies with good HSE programs understand this. Companies who ignore the expertise that comes with day to day hands on experience will only see the same mistakes made over and over again. I still have the company safety manual that was given to me as an apprentice. I can tell you by the time I left that company to start my own business 19 years later, I knew that manual from cover to cover. Companies who care about their employees take the time to invest first in their HSE program so that everyone who works there is on the same page when it comes to how they manage Health, Safety and Environmental issues. Companies who wonder why they have so many Safety and Environmental Incidents make their employees guess. 10. Employees Are Afraid to Report Incidents & Near Misses – Having a great HSE program requires an open door at every level of your company. If someone from the shop floor tells a Supervisor about a safety concern and that concern is ignored without explanation, that employee should feel comfortable and welcome to report it the next level up. If you don’t have this as an engrained part of your company culture you’re in trouble. Companies who care about the safety and wellbeing of their employees encourage them to report all incidents and near misses. Companies who don’t, ignore what’s going on and discourage or even punish people for reporting incidents and near misses. In closing, while some and maybe even most who read this list will find it shocking. And then there are those who are going to be checking off one sign after another as they go down the list and saying to themselves “Doug must have visited our site and he’s written this article about us.” If you’re in that category and working in that environment, you need to understand nothing will change until someone steps forward. In the end we are all responsible for our own safety but it’s those who lead by example who will always make the most impact. Be safe, and work safe! « Why Do DOE Upstream?